The Bolivian border post is unprepossessing to say the least. It’s a small hut with a long winding queue of increasingly disgruntled tourists, furiously arguing because they are being made to pay an unexpected exit fee. It’s operated by a single man, who sits at one desk, complete with stand-up sign, to count his takings and another, to stamp passports. I’ve also gone back an hour in time, which I don’t understand at all, when I’m travelling east. I’m sure there’s some logic to it somewhere. 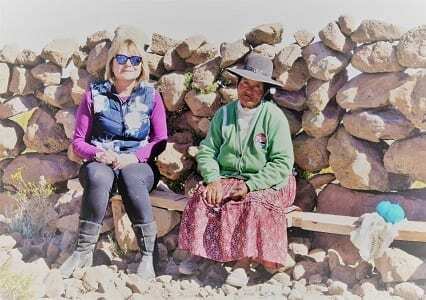 It’s 400 kilometres to Uyuni. These are Bolivian kilometres, very different to European kilometres, says Oswaldo my new guide. The driver is called Wilson and he’s in charge of a Toyota Landcruiser. It’s the affordable car of choice here, where the roads are nearly all dirt, except in areas around mines where corporate mining conglomerations have funded a surface of sorts to get their ore out. 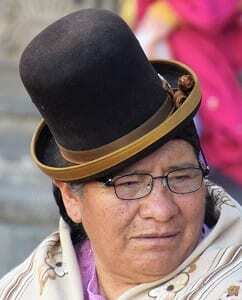 Bolivia is mineral rich, but hasn’t the resources and technology to extract the wealth it’s sitting on. It hasn’t helped that relationships with the USA have been frosty and the American companies have all pulled out in case their assets were nationalized. Oswaldo says that President Morales has been in power too long and now he’s mad. He’s currently requesting a fourth term in office, when the law says only two are allowed. It’s an all too common story. The scenery however, is not at all common; it is increasingly incredible, as we climb away from Mount Licancabur. The carved peaks, canyons, huge salt lakes, volcanic cones and flat, open valleys are uniquely beautiful and genuinely rainbow coloured, with starkly contrasting blues, greens, purples, yellow, orange and reds. It’s vividly surreal. 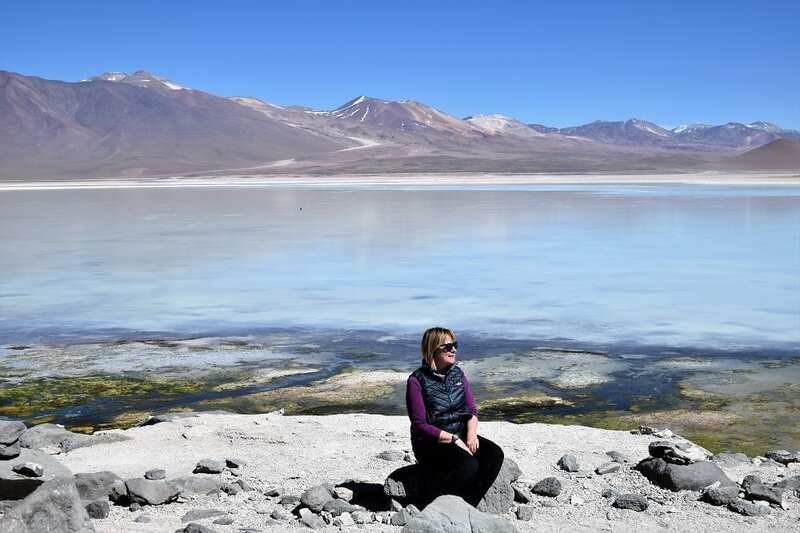 So surreal that part of the route is known as the Salvador Dali Desert and features in his paintings, though Oswaldo says he never came here. Oswaldo also bemoans the fact that the beautiful lagoons are drying up, because of global warming. 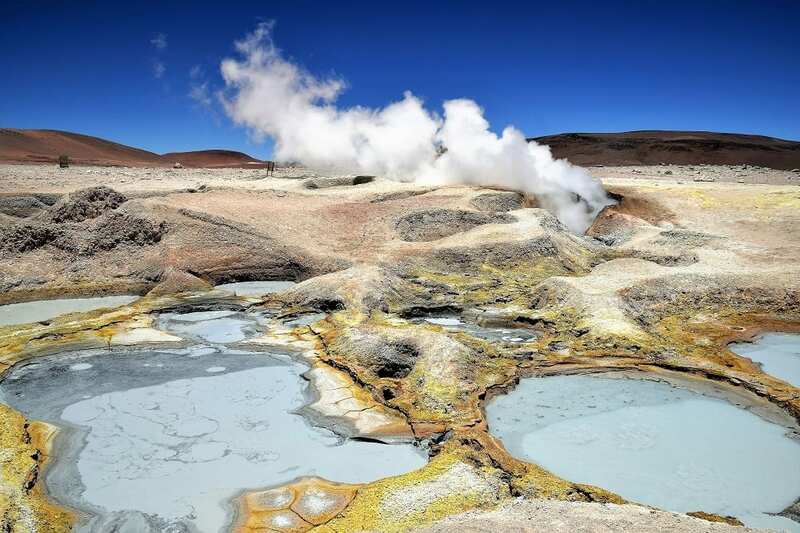 First, the frosted white and green lagoons, a 4500 metre high spectacle, nestling just the other side of Licancabur. 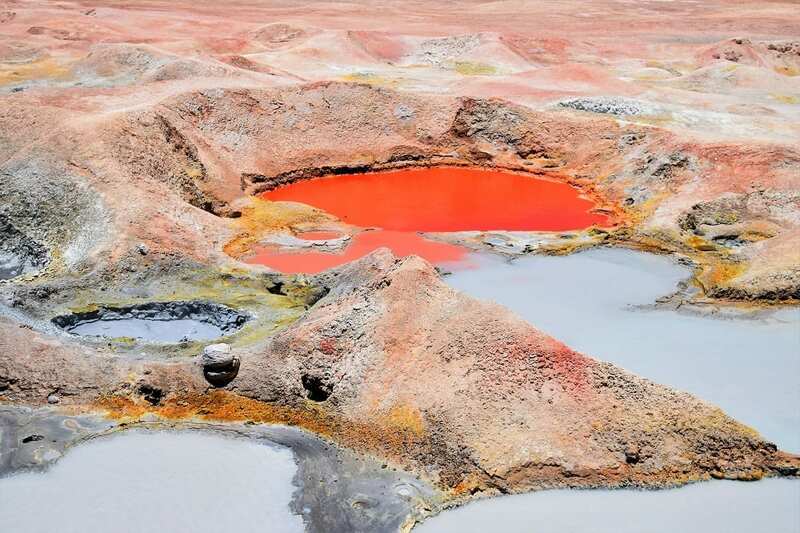 Then, beyond Dali’s Painted Ladies of the Desert, a fantasia of peaks daubed in pinky reds, yellow ochre and black, up to the Sol Manyana (Morning Sun) hot spring geysers at 4870 metres. I’m not expecting much, after the columns of Tatio, and the actual geysers are indeed diminutive in comparison. But these are just the backdrop for a raft of bubbling spitting pools, hues ranging from grey, through dusky pink, to bright orange, surrounded by a whole, exquisite artists’ palette of salt encrusted rings. Forget the mud volcanoes in Azerbaijan. These are far more impressive. 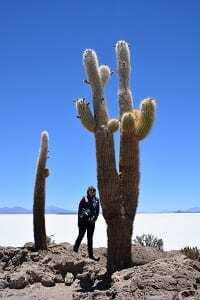 San Pedro had me enthralled, but Bolivia is surpassing the Chilean Atacama. This is a delightful day of continuing surprises, one of the most amazing journeys I have undertaken. The highlight is yet to come. 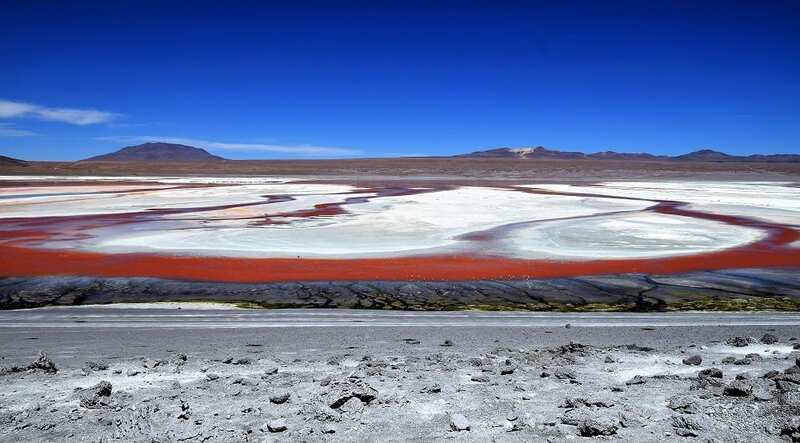 The Laguna Colorado (Red Lagoon), despite, as Oswaldo keeps reminding me, its diminishing size, is almost beyond words, utterly extraordinary, with stripes and swirls of powder white, jade and copper, dotted with thousands of feathery flamingo balls. The City of Rock beyond it is, of course, also magnificent. It looks like a ruined medieval town from a distance, but in fact it’s the spectacular remains of eroded volcanic flow. There are countless gigantic edifices that become mansions, puma’s heads, moas, howling wolves and bell towers, with a little imagination. I’m the only person visiting, we’ve hardly seen a car since we left the Laguna Colorado, where there were maybe a dozen vehicles parked up when we left. The population here is so sparse, its almost beyond remote. I’ve been anxious to take a picture of a lady wearing the traditional bowler hats I remember from my last visit, but the only woman I’ve seen so far was collecting tickets at one of the gates and she was wearing a baseball cap. It’s so dry, there’s hardly any snow, despite the fact it’s cold., high country. 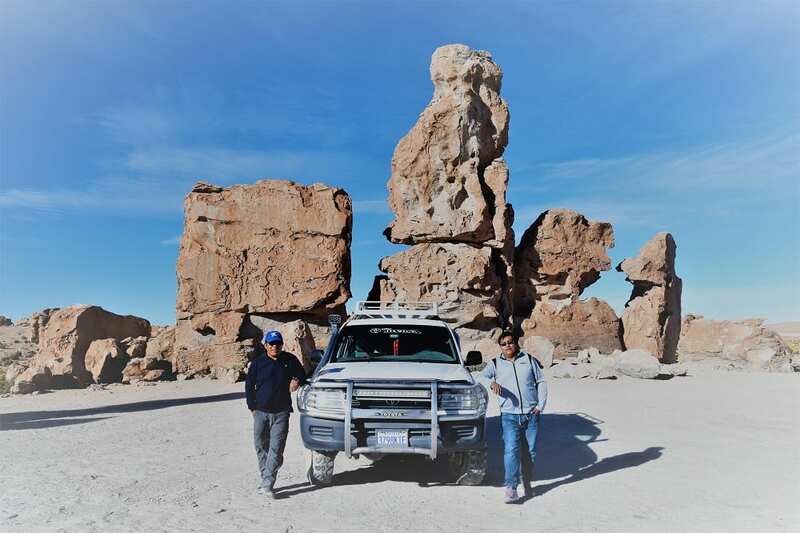 Nothing will grow in this rocky terrain until we drop, from our 5000 metre highpoint, through the Eduardo Avaroa National Park, to the streams and velvet greenery of the altiplano. 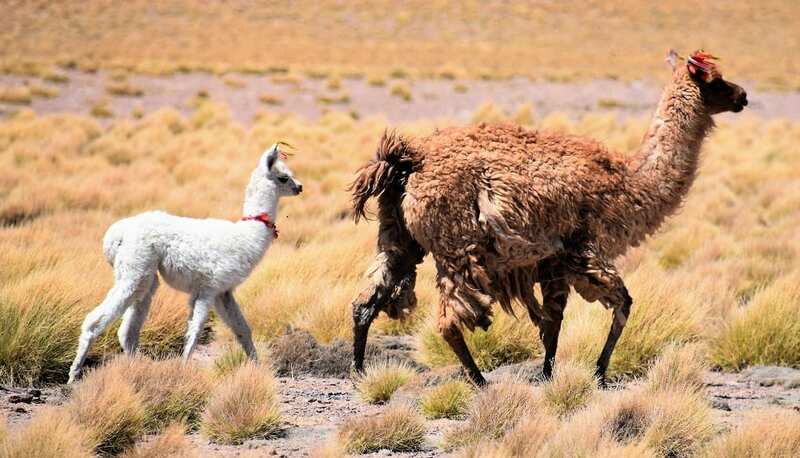 This area is beloved by llama, who wander freely. There’s no fencing at all. The 4WD is great fun, speeding across the wide valleys, often choosing our own route across the ruts. If rain wasn’t so scarce the road would be much more difficult. Wilson plays Bolivian mountain music throughout the journey; El Paso Condor meets Swiss yodelling. He also stuffs his mouth with coca leaves the whole time we’re driving. I’ve tried one and it hasn’t had much effect. But he eats handfuls at a time. Maybe that’s where I’m going wrong. Whenever we’re parked Wilson cleans the car, which is some challenge in this dust. He’s fanatical about the Toyota. Unfortunately, it doesn’t belong to him, though he wishes it did. We roll into Uyuni at 7.30 pm and I head straight for bed. Travelling in such dry climates has its drawbacks. My hair is like straw, lips peeling, nose bunged up, hands sandpaper. My iPhone won’t even recognise my fingerprint. Today, we’re picking our own route again, straight across the glistening giant paving slabs that are the salt flats. Once again, I’ve set my expectations too low; the salt stretches in all directions, a snowy ocean, curving on the horizon, the volcanoes forming a diorama at the rim, surmounted by a cerulean sky. 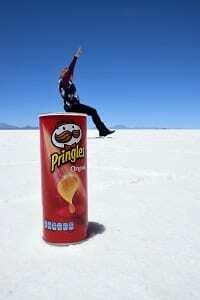 The salt is 10 metres deep, 15 kilometres wide and 70 kilometres long. It’s another wonderful adventure, although sadly, with the exception of a few pools at the edges, the famous reflections are almost absent. There hasn’t been any rain. Incongruously, there’s a Dakar Rally monument en route, bearing an African turban. They ran the race here from 2014 to 2017, before deciding it was too destructive for the fragile environment. Stretched across the centre of the Salar is a string of small islands. Isla Incahuasi is crammed with spiky columnar cacti with huge bent fingers, impossibly picturesque against the blue and white background. Needless to say, it’s even better than Cactus Valley. Wilson has prepared a picnic lunch, which we eat at a cloth covered table, under an umbrella, out in the salt flat. Another surreal experience. The red stools against the tessellated salt trace patterns reminds me of last year’s picnic lunch in the lagoon at Tuvalu. It was warmer there. The food is typically Bolivian- plenty of carbohydrate, potato, banana, and quinoa (a local crop) with some chicken and vegetables. We spend the afternoon pottering around the far fringes of the plain. There are caves, filed with filigree tracery, carved by the water, when it was much higher, soaring rock columns (the most notable is known as Cathedral Rock), a multi-coloured volcano towering over quinoa fields, golden grass, some burial caves containing mummies and a few flamingos. We speed back across the salt – I keep wanting to say ice – to tonight’s lodging on the eastern edge of the plain. It’s called Luna Salada and it’s built entirely of salt. Rodrigo meets me off my flight to La Paz. He is dapper with a straw trilby and speaks English, French, German and Spanish fluently. I’m expecting to have a quiet day, with a chance to catch up and rest, but Rodrigo informs me that I’m touring the city today, as there’s a national protest against Evo Morales’ proposed fourth term called for tomorrow and all the main roads will be blocked. Rodrigo is more philosophical about Morales than Oswaldo. Yes, he’s gone a little crazy, but he’s done so many good things. The country is much more prosperous and homogenous. And Morales doesn’t mind if people criticise him. Rodrigo says that Bolivia has the world record for presidential coups, 120 of them. There were three presidents in one day in the early twentieth century. La Paz is hardly recognizable from the city I visited 18 years ago. It’s still a jumble of buildings sprawling scenically across a great canyon, ringed by the snow-capped Andes, and the traffic is still awful. But it’s clean and organised and there are modern buildings spinning up everywhere. Nothing like the dirty ramshackle streets I remember. And some genius has solved the pedestrian transport problem by building a colour coded metro system of cable cars, interlinking and whizzing up and down the valleys. We wind down pastel coloured, restored colonial streets and visit the Murillo Plaza for the presidential palace and parliament building. It’s really lively, a cross-section of Bolivian life sitting on the steps chatting, or in the case of the younger generation, chasing the pigeons. It’s fascinating to see how European dress has become the norm here. Many of the city ladies don skirts with layered petticoats, topped with blouses and woolly cardigans. There are plenty of bowler hats here, worn jauntily askew, above long braided plaits. We drive out to Moon Valley, much smaller and to be fair, on this occasion, far inferior to the Chilean version, with its beige crags. wW then zip back across town on the green and yellow lines. Here there’s a great view of the new and old, teetering on the cliff tops. Finally, the witches’ market, a labyrinth of shops selling herbs and other medicaments. This area is unrecognizable since my last visit, having been substantially upgraded. There are now lines of neat booths, packed with jars, teas, coca leaves, idols of varying sizes, and heaps of lurid coloured rocks, facing a row of football gear shops. In many cases stock has expanded to include souvenirs, as well as items from all continents, such as joss sticks and Chinese lucky cats, to cover all bets. There’s even a brand-new gallery. Not everything has changed though. 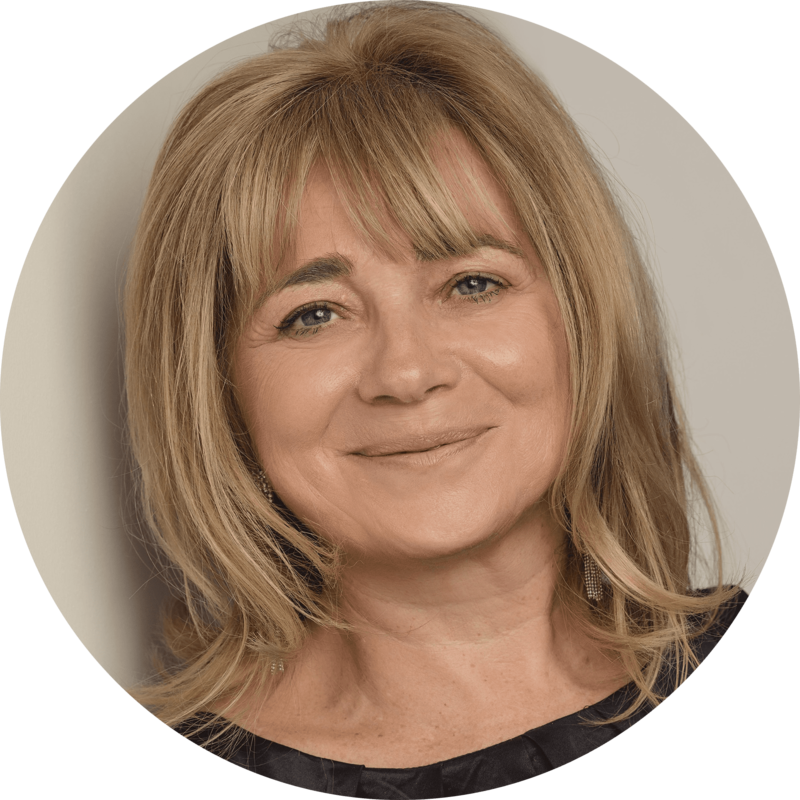 You can still have a consultation with a shaman or witch or choose from a pungent smelling assortment of herbs and powders and most of the shops still have llama foetuses dangling from the ceiling. We finish at the cathedral, on another vibrant plaza. My hotel is, conveniently, just around the corner. Llama steak for supper. My ‘boutique’ hotel is in a traditional converted house, with brick walls and gabled ceilings. I’m in Room 101, which is living up to its name. It faces out onto a central corridor, as does its only window. This is cloth covered and too dark during the day and too bright at night, especially as the passage light comes on every time someone walks past. I’m not sure that my disturbed night entirely accounts for the racing heart, shivering and dizziness when I finally get up. I peek outside, at the riot police, grouped by the plaza, plastic shields raised, but I have to go back to bed. Altitude sickness seems to have set in. The hotel, not missing a trick (well it is next to the witches’ market), has provided Diamox in the room, at 2 US dollars a pop. The chemist next door sells 8 for 45 Boliviano (about £5) and I’m also throwing caution to the winds and adopting Wilson’s approach to coca leaves. I can hear chanting and a few firecrackers outside, but nothing that suggests a revolution is taking place. I’ve had an unwelcome message from Rodrigo, we have to leave earlier than planned, at 5 a.m. in case the roads are still difficult. In the event we have a very smooth passage and I’m at the airport with plenty of time to sit in the café. I’m still not feeling great. And the plane doesn’t take off until three passengers have volunteered (suitably bribed) to get off and fly tomorrow. We’re overweight and the plane won’t be able to get over the mountains. I’m carefully not making eye contact with the airline officials. Back to Santiago. Landlocked Bolivia is the highest and most isolated country in South America. The country was once the centre of the ancient Tiwanaku Empire and from the fifteenth to the early sixteenth century it was ruled by the Incas. After the arrival of Pizarro and the Spanish conquistadors, Bolivia was subsumed within the Viceroyalty of Peru. Spain built its empire in great part upon the silver that was extracted from Bolivia’s mines. The republic was finally established in 1825, after many years of war, named for Venezuelan Simón Bolívar, El Libertador. More war followed, with Bolivia losing control of several parts of its territory, including the seizure of its piece of Pacific coastline, by Chile in 1879. 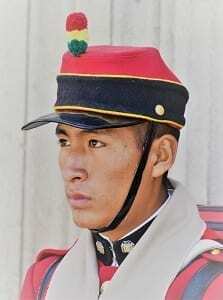 To see more of my photos of Bolivia, visit this page.